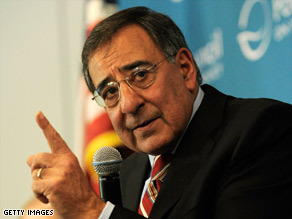 CIA Director Leon Panetta speaks about the fight against al Qaeda at the Pacific Council on International Policy. U.S. forces have been battling al Qaeda and its Taliban allies in Afghanistan since the terrorist network's 2001 attacks on New York and Washington. Both have taken root across the rugged border in Pakistan, where Pakistani troops are waging an air and ground offensive to crush the Taliban in the Swat Valley, northwest of the capital, Islamabad. Prime Minister Yusuf Reza Gilani said Monday that the offensive will go on "until peace is established."